I am starting a new series - anecdotes from the lives of some famous people. Small snippets that I have collected over time. These are musicians, scientists, inventors - many that you know. Here is an mystery surrounding the death of famous Russian composer Pyotr Tchaikovsky. According to official reports, Russian composer Pyotr Tchaikovsky (1840-1893) died in his brother Modest’s apartment on November 6, 1893, just days after drinking contaminated water and contracting cholera. 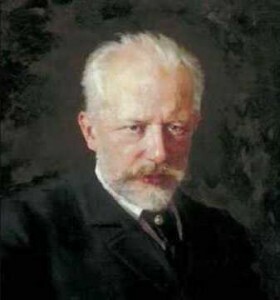 But rumors soon circulated that Tchaikovsky committed suicide after a homosexual affair threatened his reputation. The rumors first surfaced because Tchaikovsky was not treated like a cholera victim. Health laws demanded, for instance, that the body be quarantined and sealed in a coffin as soon as possible. But a composer colleague reported viewing Tchaikovsky’s body at Modest’s apartment while choirs sang requiems and throngs of people looked on. Conflicting medical reports added to the suspicion that friends, relatives, and doctors were hiding the truth to shield Tchaikovsky’s legacy. An unofficial account of Tchaikovsky’s death suggests that he’d become involved with the nephew of a powerful duke. Incensed about the affair, the duke denounced Tchaikovsky to Czar Alexander III, who convened a “court of honor.” The court, many now believe, sentenced Tchaikovsky to death by suicide, probably by poison. Homosexuality was illegal in Imperial Russia. It was tolerated if accompanied by discretion, but public exposure could carry harsh consequences. Although Tchaikovsky’s closest friends and relatives knew he was gay, they guarded this knowledge carefully. The composer confided to his brother Modest, for instance, that his sexual desire for other men brought him inner torment, but only later did Modest characterize these illicit passions as the driving force behind his brother’s music. He claimed, for example, that unrequited love for a former classmate inspired Tchaikovsky’s rapturous adaptation of Romeo and Juliet. That same classmate would eventually serve as a judge on Tchaikovsky’s court of honor.